This section classifies land uses and activities into use categories on the basis of common functional, product or physical characteristics. Characteristics include the type and amount of activity, the type of customers or residents, how goods and services are sold or delivered, and certain site factors. The use categories provide a systematic basis for assignment of present and future uses to zones. The decision to allow or prohibit the use categories in the various zones is based on the goals and policies of the Comprehensive Plan. The names of the use categories start with capital letters throughout the Zoning Code. Uses are assigned to the category whose description most closely describes the nature of the primary use. The “Characteristics” subsection of each use category describes the characteristics of each use category. Developments may have more than one primary use. Developments may also have one or more accessory uses. Developments with more than one primary use are addressed in Subsection B. below. Accessory uses are addressed in Subsection C. below. whether the activity would be likely to be found independent of the other activities on the site. B. Developments with Multiple Primary Uses. When all the primary uses of a development fall within one use category, then the development is assigned to that use category. For example, a development that contains a retail bakery and a café would be classified in the Retail Sales and Service category because all the primary uses are in that category. When the primary uses of a development fall within different use categories, each primary use is classified in the applicable category and is subject to the regulations for that category. C. Accessory Uses. Accessory uses are allowed by right in conjunction with the use unless stated otherwise in the regulations. Also unless otherwise stated, they are subject to the same regulations as the primary use. Common accessory uses are listed as examples with the categories. D. Use of Examples. The “Examples” subsection of each use category provides a list of examples of uses that are included in the use category. The names of uses on the list are generic. They are based on the common meaning of the terms and not on what a specific use may call itself. For example, a use whose business name is “Wholesale Liquidation” but that sells mostly to consumers, would be included in the Retail Sales and Service category rather than the Wholesale Sales category. This is because the actual activity on the site matches the description of the Retail Sales and Service category. 710.040 Determination of Use Category. a description of the decision made. At the option of the applicant the City shall provide notice and hearing through a Type II review as described in Section 520.100 and through 520.130. A determination of use category decision may be appealed to the Land Use Board of Appeals subject to the appeal period described in ORS 197.830(4)(b). A determination of use category which is reviewed in a Type II process can be appealed to the Land Use Board of Appeals within 21 days of the date of the Notice of Decision. No appeal to the Wood Village City Council is allowed. A. Characteristics. Household Living is characterized by the residential occupancy of a dwelling unit or a structure by a household. The average length of stay is 90 days or longer. (See Exceptions). B. Accessory Uses. Accessory uses commonly found include: recreational activities, raising of household pets, hobbies and parking of occupants’ vehicles. Home occupations are an accessory use subject to additional regulations. C. Examples. Uses include living in houses; duplexes; apartments; manufactured homes; condominiums; retirement centers. Lodging in a dwelling where the average stay is 90 days or less is not Residential Living. (See Retail Sales and Service category for hotels and motels. See Community Service category for drug and alcohol treatment programs, post and alternative incarceration programs, and alternative to prosecution programs). Detached radio and television antennas and towers are a conditional accessory use subject to conditional use review. A. Characteristics. Group living is characterized by the residential occupancy of a structure by a group of 6 or more people who do not meet the definition of Household Living. The average length of stay is 90 days or longer. Uses where people stay, on average, less than 90 days are not considered residential. They are considered to be a form of transient lodging (see exceptions). Generally, Group Living structures have a common eating area for residents. The residents may or may not receive any combination of care, training, or treatment, as long as they also reside at the site. B. Accessory Uses. 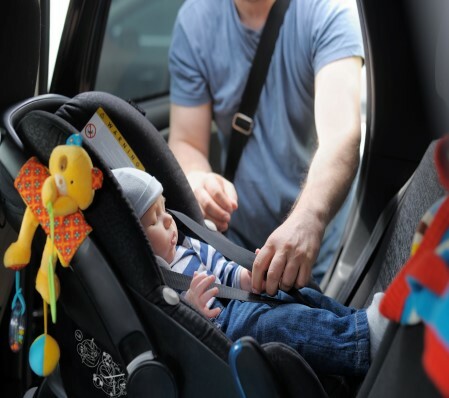 Accessory uses commonly found are recreational facilities, parking for autos for the occupants and staff, and parking of vehicles for the facility. C. Examples. Examples include dormitories; communes; fraternities and sororities; monasteries and convents; nursing and convalescent homes; group homes for the physically disabled, mentally retarded, or emotionally disturbed. Lodging where the average length of stay is less than 90 days is not Group Living (See Retail Sales and Service Category for Hotels and Motels. See Community Service Category for drug and alcohol treatment programs, post and alternative incarcerations programs and alternative to prosecution program). Facilities for people who are under judicial detainment and are under the supervision of sworn officers are included in the Detention Facilities category. A. Characteristics. Commercial Recreation uses are large, generally commercial uses that provide continuous recreation or entertainment oriented activities. They may take place in a number of structures or in an outdoor setting. B. Accessory Uses. Accessory uses may include concessions, restaurants, parking, caretaker’s quarters, and maintenance facilities. C. Examples. Examples include amusement parks, theme parks, gaming, water parks, spas, golf driving ranges, miniature golf facilities, zoos and marinas. Golf courses are classified as Parks and Open Space. Uses which draw large numbers of people to periodic events, rather than on a continuous basis, are classified as Major Event Entertainment. A. Characteristics. Retail sales of marijuana products as provided by state licensing for the recreational use of marijuana products as permitted by state law. B. Accessory Uses. Accessory uses may include sales of foods and other retail commodities. C. Examples. Examples include a marijuana sales store. Any such use is subject to regulation for distances from designated youth facilities as provided in the underlying authorization code. B. Accessory Uses. Accessory uses may include auto repair and tire sales. C. Example. Examples include full-serve and mini-serve gas stations, unattended card key stations, car washes, quick lubrication and tune-up services, and Department of Environmental Quality vehicle emission test sites. Truck stops are classified as Industrial Service. Refueling facilities for the vehicles that belong to a specific use (fleet vehicles) which are on the site where the vehicles are kept, are accessory to the use. A fuel service station meeting the specific requirements in Section 710.240.B. (1) through (5) is deemed an Accessory Use to the primary Retail Sales and Service Use. A. Characteristics. Major Event Entertainment uses are characterized by activities and structures that draw large numbers of people to specific events or shows. Activities are generally of a spectator nature. B. Accessory Uses. Accessory uses may include restaurants, bars, concessions, parking, and maintenance facilities. C. Examples. Examples include stadiums, sports arenas, coliseums, race tracks (horse, dog, etc. ), auditoriums, exhibition and meeting areas, and fairgrounds. Exhibition and meeting areas with less than 20,000 square feet of total event area are classified as Retail Sales and Service. Banquet halls that are part of hotels or restaurants are accessory to those uses, which are included in the Retail Sales and Service category. Theaters, including drive-in theaters, are classified as Retail Sales and Service. Automobile racing tracks are prohibited. E. Characteristics. Restricted Access Commercial Entertainment and Recreation uses are characterized by activities and structures that prohibit public access by requiring the purchase of goods or services not directly related to the entertainment or recreational activity. F. Accessory Uses. Accessory uses may include any Permitted uses in the base zone, parking, and maintenance facilities. G. Examples. Examples include water parks accessible only to individuals who are paying guests of a connected hotel or motel, amusement or electronic devise areas available only to individuals purchasing transportation or lodging services. Exhibition, meeting, or entertainment uses which admit members of the public based on payment of an entry fee and without requiring the purchase of other affiliated goods or services, are treated as commercial recreation (Not Restricted Access Commercial Entertainment). Banquet halls, lobbies, conference rooms/facilities or meeting spaces that are part of hotels or restaurants are accessory to those uses, may be restricted for access and entertainment purposes, and are not classified as Restricted Access Commercial Entertainment. A. Characteristics. Office uses are characterized by activities conducted in an office setting and generally focusing on business, government, professional, medical, or financial services. B. Accessory Uses. Accessory uses may include cafeterias, health facilities, parking or other amenities primarily for the use of the employees of the firm or building. C. Examples. Examples include professional services such as lawyers, accountants, engineers, or architects; financial businesses such as lenders, brokerage houses, bank headquarters, or real estate agents; data processing; sales offices; government offices and public utility offices; TV and radio studios; medical and dental clinics, medical and dental labs; and blood-collection facilities. Offices that are part of and are located with a firm in another category are considered accessory to the firm’s primary activity. Headquarters offices, when in conjunction with or adjacent to a primary use in another category, are considered part of the other category. Contractors and others who perform services off-site are included in the Office category if equipment and materials are not stored on the site and fabrication, services, or similar work is not carried on at the site. A. Characteristics. Retail Sales and Service firms are involved in the sale, lease or rent of new or used products to the general public. They may also provide personal services or entertainment, or provide product repair or services for consumer and business goods. (c) Does not exceed thirty percent (30%) of the retailer’s building floor area within the site or center (not counting electric vehicle charging stations). (d) Kiosks providing vehicular needs such as water, compressed air, or vending products such as lubricants, anti-freeze, other fluids, parts or accessories, singly or in any combination. Product-oriented: Stores selling, leasing, or renting consumer, home, and business goods including art, art supplies, bicycles, clothing, dry goods, electronic equipment, fabric, furniture, garden supplies, gifts, groceries, hardware, home improvements, household products, jewelry, pets, pet food, pharmaceuticals, plants, printed material, stationary, videos, and food sales. Personal Service-oriented: Branch banks, urgency medical care, laundromats, photographic studios, photocopy and blueprint services, quick photo finishing; hair, tanning, and personal care services, business, martial arts, and other trade schools, dance or music classes, taxidermists, mortuaries, veterinarians, and animal grooming. Entertainment-oriented: Restaurants, cafes, delicatessens, taverns and bars; indoor or outdoor continuous entertainment activities such as bowling alleys, ice rinks, game arcades, pool halls, indoor firing ranges, theaters, health clubs, gyms, and membership clubs. Repair-oriented: Repair of TV’s. bicycles, clocks, watches, shoes, guns, appliances and office equipment, photo or laundry drop-off, quick printing, recycling drop-off, tailor, locksmith, and upholsterer. Lumber yards and other building material sales that sell primarily to contractors and do not have a retail orientation are classified as Wholesale Sales. Sales of landscape materials, including bark chips and compost, is classified as Industrial Service. Sales, rental, or leasing of heavy trucks and equipment is classified as Wholesale Sales. Hotels, restaurants, and other services which are part of a truck stop are considered an accessory to the truck stop which is classified as Industrial Service. A. Characteristics: Lodging shall include hotel, motel, and similar commercial properties engaged in the rental of rooms to tourists or other temporary guests. Along with accommodations, firms in the lodging industry may provide restaurant or other meal provision, meeting rooms and banquet facilities, parking facilities, and accommodations to guests for recreation or other leisure activities while staying at the property. B. Accessory Uses. Accessory uses may include office, parking, recreation and convention facilities. C. Examples: Lodging includes facilities whose primary purpose is the accommodation of travelers, tourists or other temporary stays, however, the duration of tenancy may provide for long term accommodation (greater than 30 days) for not more than 50% of all provided accommodations. Facilities owned and operated exclusively for long term tenancy, with most stays exceeding 30 days. Such facilities shall be identified as multifamily housing, and shall be regulated as residential land uses. Rental or sales of materials and services from individual spaces shall be treated as retail sales and service. A. Characteristics. Self-Service Storage uses provide storage areas for individual or business uses. The storage areas are designed to allow private access by the tenant for storing or removing personal property. B. Accessory Uses. Accessory Uses may include living quarters for a resident manager or security and leasing offices. Use of the storage areas for sales, service and repair operations, or manufacturing is not considered an accessory to the Self-Service Storage use. The rental of trucks or equipment is also not considered an accessory to a Self-Service Storage use. C. Examples. Examples include single story and multi-story facilities that provide individual storage areas for rent. These uses are also called mini-warehouses. D. Exceptions. A transfer and storage business where there are no individual storage areas or where employees are the primary movers of the goods to be stored or transferred is the Warehouse and Freight Movement category. A. Characteristics. Firms servicing passenger vehicles, light and medium trucks and other consumer motor vehicles such as motorcycles, boats and recreational vehicles. Generally, the customer does not wait at the site while the service or repair is being performed. B. Accessory Uses. Accessory uses may include offices, sales of parts, and vehicle storage. C. Examples. Examples include vehicle repair, transmission or muffler shop, auto body shop, alignment shop, auto upholstery shop, auto detailing, and tire sales and mounting. D. Exceptions. Repair and service of industrial vehicles and equipment, and of heavy trucks; towing and vehicle storage; and vehicle wrecking and salvage are classified as Industrial Service. A. Characteristics. Industrial Service firms are engaged in the repair or servicing of industrial, business or consumer machinery, equipment, products or by-products. Firms that service consumer goods do so by mainly providing centralized services for separate retail outlets. Contractors and building maintenance services and similar uses perform services off-site. Few customers, especially the general public, come to the site. B. Accessory Activities. Accessory activities may include office, parking, storage, and rail spur or lead lines. C. Examples. Examples include welding shops; machine shops; tool repair; electric motor repair; repair of specific or professional instruments; sales, repair, storage, salvage or wrecking of heavy machinery, metal and building materials; towing and vehicle storage; auto and truck stops; building, heating, plumbing or electrical contractors; printing, publishing and lithography; exterminators; recycling operations; janitorial and building maintenance services; fuel oil distributors; solid fuel yards; research and development laboratories, laundry, dry-cleaning, and carpet cleaning plants; and photofinishing laboratories. Contractors and others who perform services off-site are included in the Office category, if major equipment and materials are not stored at the site, and fabrication, or similar work is not carried on at the site. Hotels, restaurants, and other services which are part of a truck stop are considered accessory to the truck stop. A. Characteristics. Manufacturing and Production firms are involved in the manufacturing, processing, fabrication, packaging, or assembly of goods. 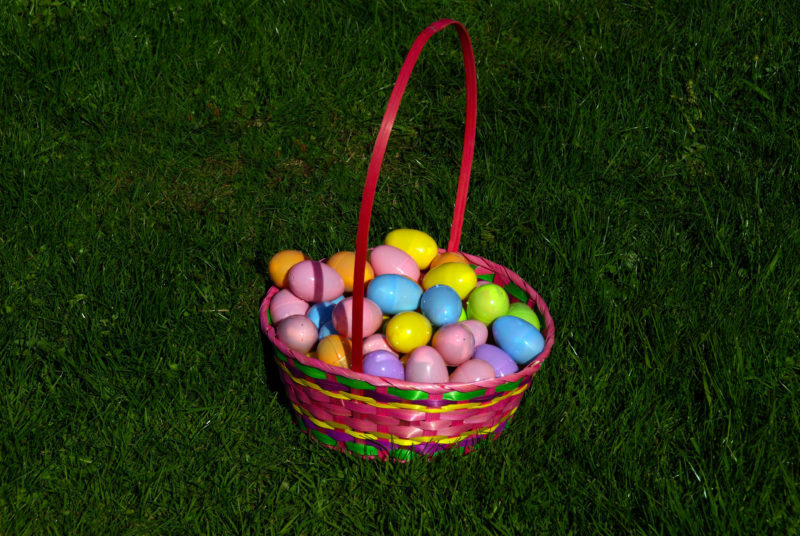 Natural, man-made, raw, secondary, or partially completed materials may be used. Products may be finished or semi-finished and are generally made for the wholesale market, for transfer to other plants, or to order for firms and consumers. Goods are generally not displayed or sold on site, but if so, they are a subordinate part of sales. Relatively few customers come to the manufacturing site. B. Accessory Activities. Accessory activities may include offices, cafeterias, parking, employee recreational facilities, warehouses, storage yards, rail spur or lead lines, repair facilities, truck fleets, and caretaker’s quarters. C. Examples. Examples include processing of food and related products; catering establishments; breweries, distilleries, and wineries; meat packing; weaving or production of textiles or apparel; lumber mills, and other wood products manufacturing; woodworking, including cabinet makers; production of chemical, rubber, leather, clay, bone, plastic, stone, or glass materials or products; movie production facilities; ship and barge building; concrete batching and asphalt mixing; production or fabrication of metals or metal products including enameling and galvanizing; manufacture or assembly of machinery, equipment, instruments, including musical instruments, vehicles, appliances, precision items, and other electrical items; production of artwork and toys; sign making; production of prefabricated structures, including mobile homes; and the production of energy. Manufacturing of goods to be sold primarily on-site and to the general public are classified as Retail Sales and Service. Manufacture and production of goods from composting organic material is classified as Waste-Related uses. Slaughter houses, animal feed lots, animal dipping, animal rendering and pulp & paper mills are prohibited. Marijuana Processing, Marijuana Production, Marijuana Wholesale. A. Characteristics. Warehouse and Freight Movement firms are involved in the storage, or movement of goods for themselves or other firms. Goods are generally delivered to other firms or the final consumer, except for some will-call pickups. There is little on-site sales activity with the customer present. B. Accessory Uses. Accessory uses may include office, truck fleet parking and maintenance areas, rail spur or lead lines, docks, and repackaging of goods. C. Examples. Examples include separate warehouses used by retail stores such as furniture and appliance stores; household moving and general freight storage; cold storage plants, including frozen food lockers; storage of weapons and ammunition; major wholesale distribution centers; truck, marine, or air freight terminals; bus barns and light rail barns; parcel services; major post office; grain terminals; and the stockpiling of sand, gravel, or other aggregate materials. Uses that involve the transfer or storage of solid or liquid wastes are classified as Waste-Related uses. Miniwarehouses are classified as Self-Service Storage uses. Marijuana Wholesale is a separate category of use. A. Characteristics. Waste Related uses are characterized by uses that receive solid or liquid waste from others for disposal on the site or for transfer to another location, uses which collect sanitary wastes, or uses that manufacture or produce goods or energy from the composting of organic material. Waste related uses also include uses which receive hazardous wastes from others and which are subject to the regulations of OAR 340.100-110, Hazardous Waste Management. B. Accessory Uses. Accessory Uses may include recycling of materials, offices, and repackaging and transshipment of by-products. C. Examples. Examples include sanitary landfills, limited use landfills, waste composting, energy recovery plants, sewer treatment plants, portable sanitary collection equipment storage and pumping, and hazardous waste collection sites. D. Exceptions. Disposal of dirt, concrete, asphalt, and similar non-decomposable materials is considered a fill. A. Characteristics. Wholesale Sales firms are involved in the sale, lease, or rent of products primarily intended for industrial, institutional, or commercial businesses. The uses emphasize on-site sales or order taking and often include display areas. Businesses may or may not be open to the general public, but sales to the general public are limited. Products may be picked up on the site or delivered to the customer. B. Accessory Uses. Accessory uses may include offices, product repair, warehouses, parking, minor fabrication services, and repackaging of goods. C. Examples. Examples include sale or rental of machinery, equipment, heavy trucks, building materials, special trade tools, welding supplies, machine parts, electrical supplies, janitorial supplies, restaurant equipment, and store fixtures; mail order houses; and wholesalers of food, clothing, auto parts, building hardware. Firms that engage primarily in sales to the general public or on a membership basis are classified as Retail Sales and Service. Firms that are primarily storing goods with little on-site business activity are classified as Warehouse and Freight Movement. A. Characteristics. Light Industrial uses involve the manufacturing, processing, assembling, packaging and treatment of products that have been previously prepared from raw materials. Because they are located in close proximity to commercial and residential uses, they are characterized by an absence of objectionable external features. Uses are clean and employee intensive industrial uses that have limited off-site impacts in terms of noise, odor, hazardous substances, glare, lights, vibration, smoke or dust. Products are generally made for the wholesale market, for transfer to other plants, or to order for firms or consumers. Goods are generally not displayed or sold on-site. B. Accessory Uses. Accessory activities may include office, parking, interior storage and truck fleets. C. Examples. Examples include research services; business support services; assembly of electrical appliances, electronic instruments and devices, including the manufacturing of small parts such as coils, condensers and transformers; photographic film processing, photoengraving, photocopying and photostatting; woodworking, including cabinet makers; weaving or production of textiles or apparel; production of artwork and toys; signmaking; packaging and processing. Manufacturing of goods to be sold primarily on-site to the general public are classified as Retail Sales and Service. Manufacturing and processing of goods which have off-site impacts incompatible with commercial and residential uses are classified as manufacturing and production. A. Characteristics. This is a business that will transform marijuana into another product, extract or cannabinoid concentrate, including cannabinoid edible, liquids or similar materials. Any person that processes marijuana within the definitions of the Oregon State Statutory provisions or Administrative Rules shall be identified as a marijuana processing facility. C. Examples. Examples include companies that accept raw marijuana and utilize a mechanical, chemical, or pressurized system to create any food or potable liquate from which a cannabinoid material is a contributing component. This will include drying of materials, creation of topical cannabinoid products, and creation of any hemp product not specifically exempted from regulation by Federal regulations. D. Exceptions. Specific drying and packaging of marijuana products may be completed by a Recreational Marijuana Producer only as permitted within the licensing authority provided by permit from the State of Oregon. A. Characteristics. This is a business that purchases marijuana items from a producer, processor or other wholesale licensee and stores, transports, and delivers such products to a retailer, another wholesaler, or processor. C. Examples. Any firm functioning to accept orders from retail outlets or similar sales organizations that sell directly to consumers, delivering in quantities to licensed retail outlets, other whole sale operations, or to processors. D. Exceptions. No packaging, processing or other treatment or modification of delivered products may take place at these facilities as the same is regulated by Oregon State Statute and Administrative Rule. A. Characteristics. This is a business that plants, cultivates, grows, harvests and dries marijuana in accord with the provisions of Oregon law, excepting outdoor production.. A producer may engage in the growing of marijuana in indoor or outdoor production facilities, and may sell or deliver only to a marijuana processor, wholesaler, retailer, laboratory or research certificate holder. Specific limitations of production size shall be only as provided by Oregon State law or administrative rule. B. Accessory Uses. Green houses, storage buildings for agricultural implements, office and parking. C. Examples. A business fully within an industrial structure utilizing artificial light and growing medium, a facility utilizing green houses or other structures, and outdoor agricultural operations specifically screened and protected as required by Oregon Law. D. Exceptions. No packaging, processing or other treatment or modification of products may take place at these facilities as the same is regulated by Oregon State Statute and Administrative Rule. No outdoor production of Marijuana is permitted. A. Characteristics. Basic Utilities are infrastructure services which need to be located in or near the area where the service is provided. Basic Utility uses generally do not have regular employees at the site. Services may be public or privately provided. B. Examples. Examples include water and sewer pump stations; electrical substations; water towers and reservoirs; stormwater retention and detention facilities; telephone exchanges; mass transit stops or turnarounds and park-and-ride facilities for mass transit. Services where people are generally present, such as fire stations and police stations, are classified as Community Services. Utility offices where employees or customers are generally present are classified as Offices. Bus and light rail barns are classified as Warehouse and Freight Movement. Regional power lines and utility pipelines are classified as Rail Lines and Utility Corridors. A. Characteristics. This category includes colleges and other institutions of higher learning which offer courses of general or specialized study leading to a degree. They are certified by the State Board of Higher Education or by a recognized accrediting agency. Colleges tend to be in campus-like settings or on multiple blocks. B. Accessory Uses. Accessory uses include offices, housing for students, food service, laboratories, health and sports facilities, theaters, meeting areas, parking, maintenance facilities, and support commercial. C. Examples. Examples include universities, liberal arts colleges, community colleges, nursing and medical schools not accessory to a hospital, and seminaries. D. Exceptions. Business and trade schools are classified as Retail Sales and Service. A. Characteristics. Community Services are uses of a public, non-profit, or charitable nature generally providing a local service to people of the community. Generally, they provide the service on the site or have employees at the site on a regular basis. The service is ongoing, not just for special events. Community centers or facilities that have membership provisions are open to the general public to join at any time (for instance, any senior citizen could join a senior center). The use can also provide special counseling, education, training or supervision on a residential or outpatient basis of a public, nonprofit or charitable nature. B. Accessory Uses. Accessory uses may include offices; meeting areas; food preparation areas; parking, health and therapy areas; daycare uses; and athletic facilities. C. Examples. Examples include libraries, museums, senior centers, community centers, publicly owned swimming pools, youth club facilities, hospices, police stations, fire stations, ambulance stations, drug and alcohol treatment centers, social service facilities for post or alternative incarceration or for alternative to prosecution programs, vocational training for the physically or mentally disabled, crematoriums, columbariums, and mausoleums. Private lodges, clubs, and private or commercial athletic or health clubs are classified as Retail Sales and Service. Commercial museums (such as a wax museum) are in Retail Sales and Service. Parks are in Park and Open Areas. Social service agencies that primarily engage in providing on-site food or overnight shelter beds are classified as Essential Service Providers. A. Characteristics. Daycare use includes day or evening care of two or more children outside of the children’s homes, for a fee. Daycare uses also include the daytime care of teenagers or adults who need assistance or supervision. B. Accessory Uses. Accessory uses include offices, play areas, and parking. C. Examples. Examples include preschools, nursery schools, latch key programs, and adult daycare programs. D. Exceptions. Daycare use does not include care given by the parents, guardians, or relatives of the children, or babysitters. Daycare use also does not include care given by a “family daycare” provider as defined by ORS 418.805 if the care is given to 12 or fewer children at any one time including the children of the provider. Family daycare is care regularly given in the family living quarters of the provider’s home. A. Characteristics. Essential Service Provider uses (ESP’s) are primarily engaged in providing on-site food or shelter beds, for free or at significantly below market rates. B. Accessory Uses. Accessory uses include offices, counseling, and facilities for recreation, restrooms, bathing, and washing of clothes. C. Examples. Examples include temporary or permanent emergency shelters, night time shelters, rescue missions, soup kitchens, and surplus food-distribution centers. Uses or functions run by or for an ESP use, but where there is no direct ESP service provided, are not in this category. Examples are administrative office, retail outlets, daytime drop-in centers, and counseling and vocational training facilities. Uses which provide food on-site as an accessory use are not included if the service is provided less than 5 days a week. For example, a church that provides a free or low cost meal once a week would not be classified as an ESP use. A. Characteristics. Dispensing of marijuana products to individuals with appropriate state authorized credentials for the intake and use of marijuana for prescribed purpose. All such facilities shall be in accord with the Oregon Health Authority regulations and shall have appropriate licenses and authorizations for dispensing marijuana. C. Examples. Examples include a marijuana dispensary. Any medical marijuana dispensary is subject to regulation for distances from designated youth facilities as provided in the underlying authorization code. A. Characteristics. Medical Centers includes uses providing medical or surgical care to patients and offering overnight care. Medical centers tend to be on multiple blocks or in campus settings. B. Accessory Uses. Accessory Uses include out-patient clinics, offices, laboratories, teaching facilities, meeting areas, cafeterias, parking, maintenance facilities, and housing facilities for staff or trainees. C. Examples. Examples include hospitals and medical complexes that include hospitals. Uses that provide extensive care and planned treatment or training for psychiatric, alcohol, or drug problems, where patients are residents of the program, are classified in the Residential Living or Community Service Categories. Medical clinics that provide care where patients are not kept overnight are classified as Office. Urgency medical care clinics are classified as Retail Sales and Service. A. Characteristics. Parks and Open Areas are uses of land focusing on natural areas, large areas consisting mostly of vegetative landscaping or outdoor recreation, community gardens, or public squares. These lands tend to have few structures. B. Accessory Uses. Accessory uses may include club houses, maintenance facilities, concessions, caretaker’s quarters, and parking. C. Examples. Examples include parks, golf courses, cemeteries, public squares, plazas, recreational trails, botanical gardens, nature preserves, and land used for grazing that is not part of a farm or ranch. A. Characteristics. Religious Institutions are intended to primarily provide meeting areas for religious activities. B. Accessory Uses. Accessory uses include Sunday School facilities, parking, caretaker’s housing, one transitional housing unit, and group living facilities such as convents. A transitional housing unit is a housing unit for Residential Living where the average length of stay is less than 90 days. C. Examples. Examples include churches, temples, synagogues, and mosques. A. Characteristics. This category includes public and private schools at the primary, elementary, middle, junior high, or high school level that provide state mandated basic education. B. Accessory Uses. 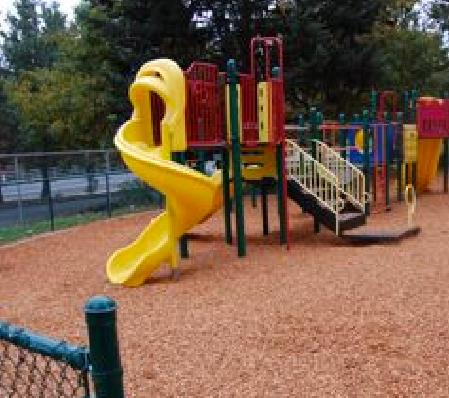 Accessory uses include play areas, cafeterias, recreational and sport facilities, and before or after-school daycare. C. Examples. Examples include public and private daytime schools, boarding schools and military academies. Preschools are classified as Daycare uses. Business and trade schools are classified as Retail Sales and Service. A. Characteristics. Detention Facilities includes facilities for the judicially required detention or incarceration of people. Inmates and detainees are under supervision by sworn officers, except when on an approved leave. B. Accessory Uses. Accessory uses include offices, recreational and health facilities, therapy facilities, maintenance facilities, and hobby and manufacturing activities. C. Examples. Examples include prisons, jails, probation centers, and juvenile detention homes. D. Exceptions. Programs that provide care and training or treatment for psychiatric, alcohol, or drug problems, where patients are residents of the program, but where patients are not supervised by sworn officers are classified as Residential Living, if the average stay is 90 days or longer and as Community Service if less than 90 days. Programs that provide transitional living experience for former offenders, such as halfway houses, where residents are not supervised by sworn officers, are also classified as Residential Living or Community Service depending on the length of stay. A. Characteristics. Mining includes mining or extraction of mineral or aggregate resources from the ground for off-site use. B. Accessory Uses. Accessory uses include storage, sorting, stockpiling, or transfer off-site of the mined mineral. C. Examples. Examples include quarrying or dredging for sand, gravel or other aggregate materials; mining; and oil, gas, or geothermal drilling. A. Characteristics. Radio and Television Broadcast Facilities includes all devices, equipment, machinery, structures or supporting elements necessary to produce nonionizing electromagnetic radiation within the range of frequencies from 100 KHz to 300 GHz and operating as a discrete unit to produce a signal or message for commercial purposes. Towers may be self supporting, guyed, or mounted on poles or buildings. B. Accessory Uses. Accessory use may include transmitter facility buildings. C. Examples. Examples include broadcast towers, communication towers, cellular telephone towers, and point-to-point microwave towers. Receive-only antenna are not included in this category. Radio and television studios are classified in the Office category. A. Characteristics. This category includes railroad tracks and lines for the movement of trains. The land may be owned or leased by the railroad. The category also includes public or private passageways, including easements, for the express purpose of transmitting electricity, gas, oil, water, sewage, communication signals, or other similar services on a regional level. B. Examples. Examples include rail trunk and feeder lines; regional electrical transmission lines; and regional gas and oil pipelines. Railroad lead and spur lines for delivery of rail cars to sites or for unloading of rail cars on specific sites are classified as accessory to the primary use of the site. Rail lines and utility corridors that are located within motor vehicle right-of-way are not included. Light rail lines are not included. Words used in this Code have their normal dictionary meaning unless they are listed in 720.030 – Definitions. Words listed in 720.030 – Definitions have the specific meaning stated, unless the context clearly indicates another meaning. 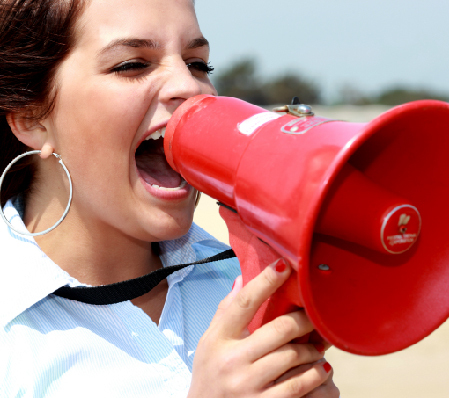 Information about the use of terms is stated in Section 100.060 – Interpretation. ACCESSORY DWELLING UNIT (ADU). A habitable living unit that provides the basic requirements for shelter, heating, cooking and sanitation, in compliance with the Uniform Building Code. ACCESSORY STRUCTURE. A structure of secondary importance or function on a site. In general, the primary use of the site is not carried on in an accessory structure. Accessory structures may be attached or detached from the primary structure. Examples of accessory structures include: garages, decks, fences, trellises, flag poles, stairways, heat pumps, small-scale residential energy equipment serving only the residents on the site, awnings, and other structures. See also Primary Structure. ACCESSORY USE. A use or activity which is a subordinate part of a primary use and which is clearly incidental to a primary use on a site. ALTERNATIVE OR POST INCARCERATION FACILITY. A residential use where the residents are on probation or parole. APPLICANT. A person who applies for a land use review or building permit. An applicant can be the owner of the property or someone who is representing the owner such as a builder, developer, optional purchaser, consultant, or architect. ATTACHED STRUCTURE. Any structure that is attached to another structure by a common wall, by a roof, or by structural connections that allow pedestrian access to both structures. For example, decks or stairways are attached structures when they are connected to another structure. A garage may be attached to another structure by sharing a wall or by a breezeway. Structures connected by an “I” beam or similar connections are not considered attached. BUILDABLE LAND. Lands in urban and urbanized areas available for development. BUILDING. A structure that has a roof and is enclosed on at least 50 percent of the area of its sides. BUILDING COVERAGE. The area that is covered by buildings or other roofed structures, including eaves. BUILDING LINE. A building limit fixed at a specific distance from the front, rear or side boundaries of a lot beyond which a structure cannot lawfully extend, except as provided for in this ordinance. CHORD. Means a straight line joining the ends of an arc. CITY. The City of Wood Village, Oregon. CITY MANAGER. 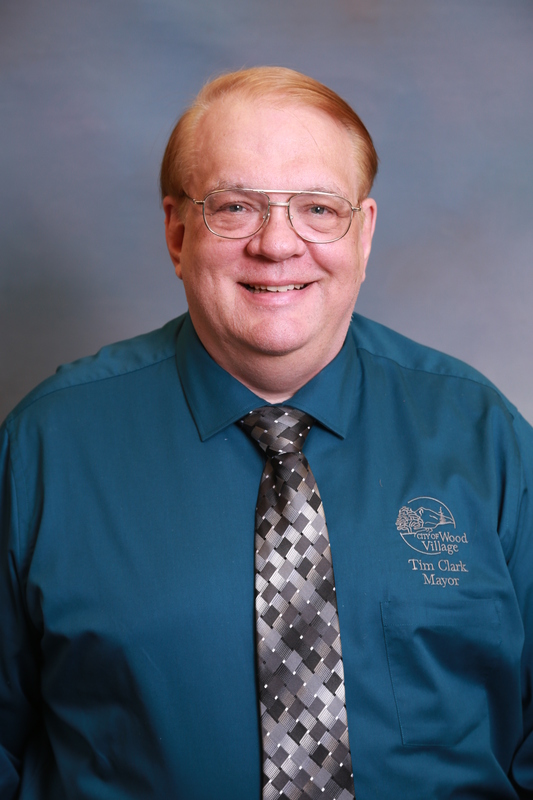 The appointed chief administrative officer of the City who is generally responsible for the administration of all City ordinances. COMPREHENSIVE PLAN. The current adopted Comprehensive Plan of the City of Wood Village. CONCEPT PLAN REGULATING DIAGRAM. The Concept Plan Regulating Diagram refers to Figure 235 – 1, which, along with requirements in Chapter 235 and other applicable chapters and sections of Wood Village Zoning and Development Code, establishes the requirements for development within the Town Center Zone area. The Concept Plan Regulating Diagram adopted in 2017 replaces and supersedes any Town Center Master Plan adopted prior to that date, and may be modified as provided in Chapter 235. COUNCIL. The City Council of Wood Village, Oregon. DAYS. Calendar days, unless specifically stated as working days. DESIRED CHARACTER. The preferred and envisioned character (usually of an area) based on the purpose statement or character statement of the base zone, overlay zone, or plan district. It also includes the preferred and envisioned character based on any adopted area plans or design guidelines for an area. Changes in the topography of the site. See also Structural alteration of a sign, under Sign-Related Definitions. DEVELOP. To construct or alter a structure or to make a physical change to the land including excavations and fills. DEVELOPMENT. All improvements on a site, including buildings, other structures, parking and loading areas, landscaping, paved or graveled areas, and areas devoted to exterior display, storage, or activities. Development includes improved open areas such as plazas and walkways, but does not include natural geologic forms or unimproved land. EXTERIOR IMPROVEMENTS. All improvements except buildings or other roofed structures. Exterior improvements include surface parking and load areas, paved and graveled areas, and areas devoted to exterior display, storage, or activities. It includes improved open areas such as plazas and walkways, but does not include vegetation landscaping, natural geologic forms, or unimproved land. See also Development. NEW DEVELOPMENT. Development of a site that was previously unimproved or that has had previously existing buildings demolished. STRUCTURE. Any object constructed in or on the ground. Structure includes buildings, decks, fences, towers, flag poles, signs, and other similar objects. Structure does not include paved areas or vegetation landscaping materials. DISABLED PERSON. For the purposes of this Code, a disabled person is a person who has a condition of physical or mental disability which substantially limits one or more major life activities as stated in the Americans with Disabilities Act of 1991 and state law. DRIVEWAYS. The area that provides vehicular access to a site. A driveway is the same width as the curb cut excluding any aprons or extensions of the curb site. A driveway begins at the property line and extends into the site. Driveway does not include parking, maneuvering, or circulation areas in parking areas. DUPLEX. See Residential Structure Types. COMPETITIVE SHORT TERM SUPPLY OF LAND: means the short term supply of land provides a range of site sizes and locations to accommodate the market needs of a variety of industrial and other employment uses. INDUSTRIAL USE: means employment activities generating income from the production, handling, or distribution of goods. Industrial uses include but are not limited to: manufacturing, assembly, fabrication, processing, storage, logistics, importation and transshipment, research and development. Industrial uses may have external impacts on surrounding uses and may cluster in traditional areas where they are segregated from other non industrial activities. OTHER EMPLOYMENT USE: Means all non industrial employment activities including the widest range of retail, wholesale, service, non-profit, business headquarters, administrative and governmental employment activities that are accommodated in retail, office and flexible building types. Other employment uses also include employment activities of an entity or organization that serve the medical, educational, social service, recreation and security needs of the community typically in large buildings or multi-purpose building campuses. Equal to or larger than five acres where less than one-half acre is occupied by permanent buildings or improvements. EXCAVATING OR FILLING. The removal, placement, or replacement of earth, concrete, asphalt, and similar non-decomposable materials whether permanent or temporary in nature. 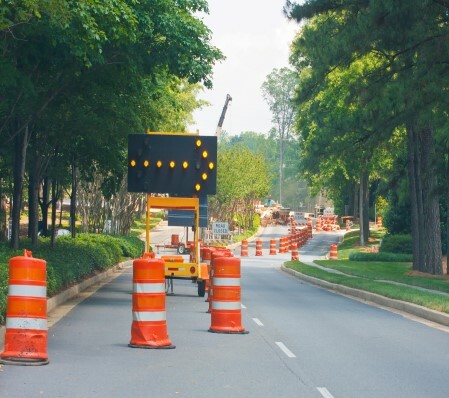 Excavating or filling does not include the movement of earth or placement of gravel, asphalt, or other paving materials that is done in conjunction with road improvements. It does not include the excavation of mineral or aggregate resources. Excavating or filling includes the terms grading, preloading, surcharging, and stockpiling. EXTERIOR ALTERATION. See Development-Related Definitions. EXTERIOR IMPROVEMENTS. See Development-Related Definitions. EXTERIOR DISPLAY. Exterior display includes the outdoor display of products, vehicles, equipment, and machinery for sale or lease. Exterior display is an outdoor showroom for customers to examine and compare products. There is variety or a distinction among the goods on display, through different products, brands, or models. The display area does not have to be visible to the street. Examples of uses that often have exterior display are car and boat sales, and plant nurseries. Exterior display does not include goods that area being stored or parked outside. It does not include damaged vehicles, vehicles or equipment being services, bulk goods and materials, and other similar products. See Exterior Work Activities and Exterior Storage. EXTERIOR STORAGE. Exterior storage includes the outdoor storage of goods that generally have little or no differentiation by type. The goods may be for sale or lease, but if so, they are the type that customers generally do not inspect and compare. Exterior storage includes the storage of raw or finished goods (packaged or bulk), including gases, oil, chemicals, gravel; building materials, packing materials; salvage goods; machinery, tools, and equipment; and other similar items. Examples are lumber yards, tool and equipment rental, bark chip and gravel sales, and the storage of goods used in manufacturing. Damaged or inoperable vehicles or vehicles which have missing parts, that are kept outside, are included as exterior storage. The storage of motor vehicles which do not have any missing parts or damage that is visible from the outside of the vehicle is considered parking rather than exterior storage. The storage of motor vehicles that have minor dents or other minor defects in the body is also considered parking rather than storage if the motor vehicle is in working order. (See Exterior Display and Exterior Work Activities). EXTERIOR WORK ACTIVITIES. Exterior work activities include the outdoor processing, assembly, or fabrication of goods; the maintenance, repair, and salvage of vehicles and equipment; and other similar activities that generally have an industrial orientation. Exterior work activities do not include normal pick-up and deliveries to a site, parking, excavation and fills, exterior eating areas, outdoor recreation, or outdoor markets. (See Exterior Display and Exterior Storage). Roofed porches, exterior balconies, or other similar areas, unless they are enclosed by walls that are more than 42 inches in height, for 50 percent or more of their perimeter. FLOOR AREA RATIO. The amount of Floor Area in square feet divided by the amount of Net Land Area in square feet. FRONTAGE. That portion of a lot abutting on a street; i.e., the front lot line. On corner or through lots the frontage may be designated by the owner but it should be consistent with the orientation of the other lots and improvements on the same side of the street. In the Town Center Zone (Section 235), frontage is defined as the portion of a lot, block, parcel or other property that abuts a public street or public easement. A card table is on the premises. GARAGES. A covered structure intended to provide shelter for passenger vehicles that is accessory to a use in these structure types: houses, attached houses, duplexes, or mobile homes. It includes carports. A garage may be attached or detached from another structure. GRADE. The degree of rise or descent of a sloping surface. GRADE. (Adjacent Ground Elevation) The lowest point of elevation of the finished surface of the ground, pacing or sidewalk within the area between the building and the property line, or when the property line is more than 5 feet from the building between the building and a line 5 feet from the building. GRADE, FINISHED. The final or finish elevation of the ground surface after the development. GRADE, NATURAL. The elevation of the ground surface in its natural state, before manmade alterations. GRADING. Any stripping, cutting, filling, stockpiling of earth or land, including the land in its cut or filled condition. GROUP LIVING STRUCTURE. See Residential Structure Types. HOME OCCUPATION. A business activity that is carried out on the same site as a dwelling unit, and which is accessory to the Household Living use on the site. HOUSE. See Residential Structure Type. A group of not more than 5 persons who are not related, or handicapped or associated with a handicapped individual, as defined above, living together as a single housekeeping unit. INTENSITY. The amount or magnitude of a use on a site or allowed in a zone. Generally, it is measured by floor area. It may also be measured by such things as number of employees, amount of production, trip generation, or hours of operation. See also Density. KENNEL. Any location where 5 or more dogs or cats aged 6 months or older, are boarded or bred. The sale of these animals may be a part of the kennel use. Establishments where animals are offered for sale as the primary use, such as pet stores are not classified as kennels. In the Town Center Zone, specific dedications for roadways and pathways required by the Concept Plan Regulating Diagram or other mandatory provisions, whether publicly dedicated or privately held; and identified as Main Street, Local Street, or Universal Street, along with the Multi-use Path/Trail shall be treated as unbuildable. At the Applicant’s discretion, up to 50 percent of the area of topographical features with a slope equal to or greater than 15 percent within a landslide hazard area. LAND DIVISION. A lot or parcel of land created through the process of dividing land. LAND USE APPROVAL. A land use decision for approval or approval with conditions. It includes any time limits or other restrictions that may apply to the land use decision. LANDSCAPE FRONTAGE. A Landscape Frontage is set back from the street-facing property line by a wide landscaped strip between the building and the sidewalk. A Landscape Frontage is appropriate along streets where the existing streetscape may not be conducive to pedestrian- oriented ground floor retail, such as where there is no on-street parking or where streets are very wide. Ground floor entries must still be provided along and connected to the sidewalk. LARGE SCALE RETAIL. For purposes of the Community Retail requirement of Section 235.275, “large scale retail uses” are those single retail uses containing 60,000 or more square feet of gross leasable area. LEGISLATIVE ACTION. Any action which would result in a change in City policy including but not limited to: change to the comprehensive plan text; change to the comprehensive plan map which involves a number of parcels of land; change to the text of an implementing ordinance; change to the zoning map which involves a number of parcels of land; change to any land use plan or map which represents a change in City land use policy. LOADING AREA. The area available for the maneuvering and standing of vehicles engaged in delivering and loading of passengers, freight, or other articles. LOT. A lot is a legally defined piece of land that is the result of subdividing or partitioning land. This definition includes the State definition of both lot, (result of subdividing), and parcel (result of partitioning). See also, Ownership and Site. CORNER LOT. A lot has frontage on more than one intersecting street. 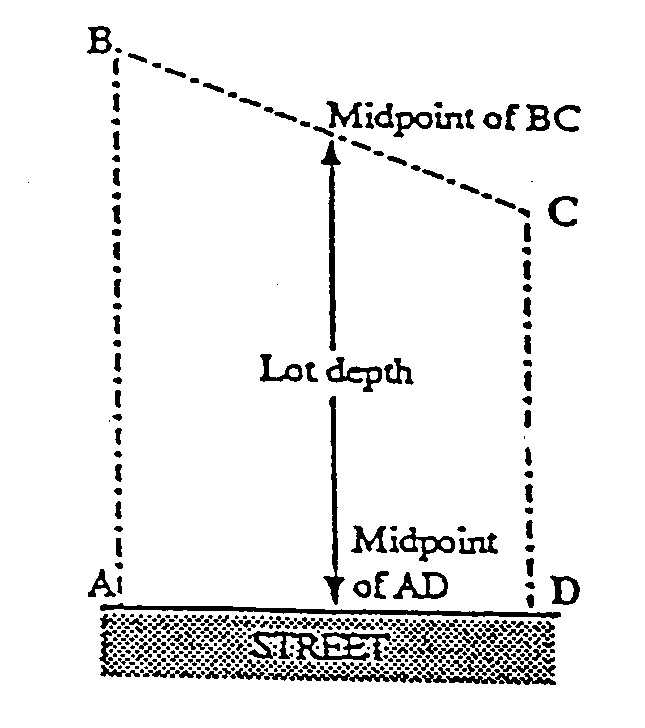 A street that curves with angles that are 120 degrees or less is considered two intersecting streets for the purpose of evaluating whether a lot is a corner lot. See below Figure. FLAG LOTS. A lot located behind another lot that has normal street frontage. A flag lot includes a strip of land that goes out to the street and is generally used for an access drive. There are two distinct parts to a flag lot; the flay which comprises the actual building site located behind another lot, and the pole which provides access from the street to the flag. 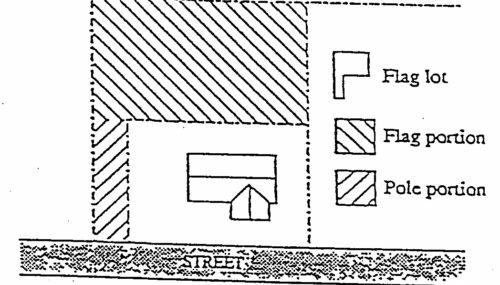 A flag lot results from the division of a large lot with the required area and depth for two lots, but which has insufficient width to locate both lots on the street frontage. See Below Figure. THROUGH LOT. A lot that has frontage on two parallel or approximately parallel streets. LOT AREA. The total horizontal area enclosed within the lot lines of a lot. LOT COVERAGE. The area covered by primary and accessory buildings. Lot coverage shall be expressed as percentage of the total lot area. LOT DEPTH, AVERAGE. The average distance from the narrowest frontage to the lot line opposite. LOT LINES. The property lines along the edge of a lot or site. FRONT LOT LINES. A lot line that abuts a street. On a corner lot, the front line is the shortest of the lot lines which abut a street. 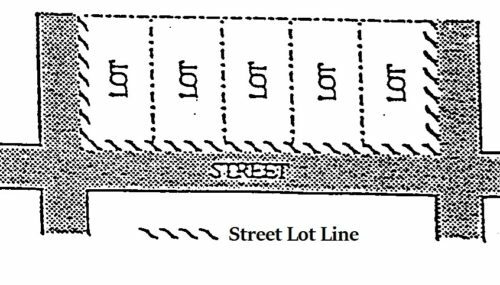 If two or more street lot lines are of equal length, then the applicant or property owner can choose which lot line is to be the front. 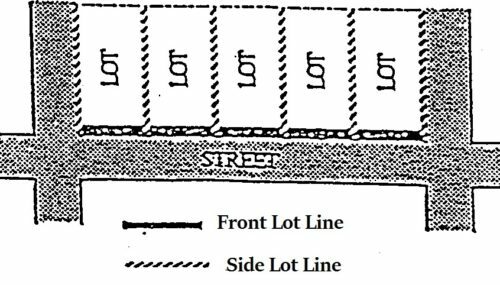 However, a through lot has two front lot lines regardless of whether the street lot lines are of equal or unequal length. REAR LOT LINE. A lot line is opposite a front lot line. A triangular lot has two side lot lines but no rear lot line. For other irregular shaped lots, the rear lot line is all lot lines that are most nearly opposite the front lot line. SIDE LOT LINE. A lot line that is neither a front or rear lot line. On a corner, the longer lot line which abuts a street, is a side lot line. 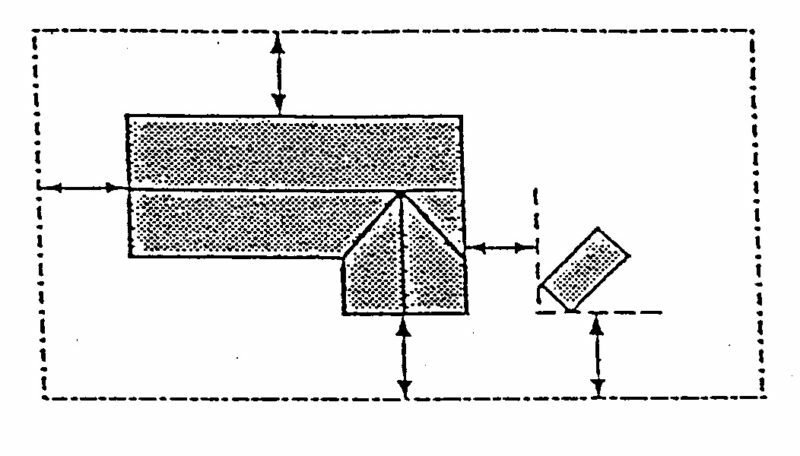 See Figure 710-3. STREET LOT LINE. Any lot lines that abut a street. Street lot line does not include lot lines that abut an alley. On a corner lot, there are two (or more) street lot lines. Street lot line can include front lot lines and side lot lines. See Figures 710-3 and 710-4. LOT OF RECORD. A lot or parcel of land for which the deed, or other instrument dividing the land, is recorder with the appropriate county recorder. LOT WIDTH. The horizontal distance between the side lot lines, measured at right angles to the lot depth at a point midway between the front and rear lot lines. LOT WIDTH, AVERAGE. The average horizontal distance between the side lot lines. MANUFACTURED HOME. See Residential Structure Types. MANUFACTURED HOME PARK. A lot, tract, or parcel with four (4) or more spaces within five-hundred (500) feet of one another available for rent or lease for the siting of manufactured homes. MANUFACTURED HOME SPACE. A plot of land within a manufactured home park designed to accommodate one (1) manufactured home, on a rental or lease basis. MITIGATE. To rectify, repair, or compensate for impacts which result from other actions. MOTOR HOME. See Recreational Vehicle, under Vehicle Types. MOTOR VEHICLE. See Vehicle Types. NEW DEVELOPMENT. See New Development Definitions. NONCONFORMING DEVELOPMENT. An element of a development, such as a setback, height, or parking area that was crated in conformance with development regulations but which subsequently, due to a change in the zone or zoning regulations, is no longer in conformance with the current applicable development standards. Nonconforming development includes development that is over a maximum allowed amount of floor area, as long as the development does not include an amount of floor area that is specifically prohibited by the current development standards. NONCONFORMING RESIDENTIAL DENSITY. A residential use that is an allowed use in the zone and that was constructed at a lawful density, but which subsequently, due to a change in the zone or zoning regulations, now has greater density than is allowed in the zone. NONCONFORMING SITUATION. A Nonconforming Residential Density, Nonconforming Development, or Nonconforming Use. A situation may be nonconforming in more than one aspect. For example, a site may contain a nonconforming use and also have some nonconforming development. See also Nonconforming Residential Density, Nonconforming Development, and Nonconforming Use. NONCONFORMING USE. A use that was allowed by right when established or a use that obtained a required land use approval when established, but that subsequently, due to a change in the zone or zoning regulations, the use or the amount of the floor area of the use is now prohibited in the zone. NONDISCREATIONARY REVIEWS. A non-discretionary review is one where compliance with the regulations can be determined based on objective standards. Decisions are made ministerially; they do not required a public hearing or notice. Examples of these reviews include: whether the proposed use is or is not allowed, whether the site area is or is not large enough for the proposed number of housing units, and whether the proposed building meets all setbacks, height and parking requirements. OPERATOR. A person undertaking a development, the proprietor of a use or development, or the owner of the land underlying a development. OWNER. The owner of the title to real property or the contract purchaser of real property of record, as shown on the latest assessment records in the Office of the County Assessor. Owner also includes a deed holder or contract purchaser whose name does not appear in the latest assessment records, but who presents to the City a copy of a deed or contract of sale showing date, book, and page of recording. OWNERSHIP. An ownership is one or more contiguous lots that are owned by the same person, partnership, association, or corporation. Ownership also includes lots that are in common ownership but are separated by a shared right-of-way. See Figure 910-11. See also, Lot and Size. PARKING AREA. A parking area is all the area devoted to the standing, maneuvering, and circulation of motor vehicles. Parking areas do not include driveways or areas devoted exclusively to non-passenger loading. See also, Driveway, Garage, and Vehicle Areas. PARKING SPACE. 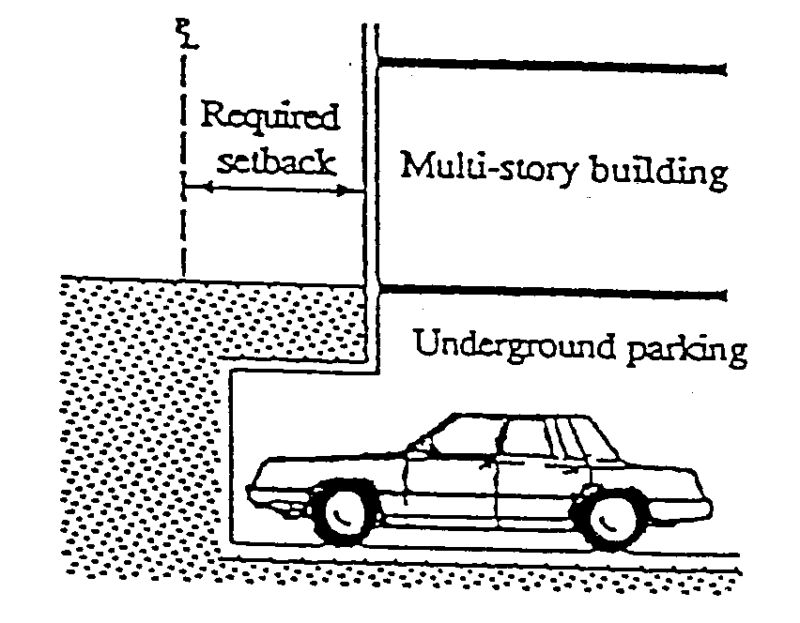 A space designed to provide standing area for a motor vehicle. PASSENGER VEHICLE. See Vehicle Types. PAVED AREA. An uncovered hard surfaced area or an area covered with a perforated hard surface (such as “Grasscrete”), that is able to withstand vehicular traffic or other heavy impact uses. Graveled areas are not paved areas. PERSON. Any person, partnership, association, or corporation. PLANNED UNIT DEVELOPMENT. A type of development that is based on a comprehensive design that addresses the entire complex of land, structures, and uses as a single project. The design plan for the project functions as a substitute for the general site development regulations of the zoning on the site. PRIMARY STRUCTURE. A structure or combination of structures of chief importance or function on a site. In general, the primary use of the site is carried out in a primary structure. The difference between a primary and accessory structure is determined by comparing the size, placement, similarity of design, use of common building materials, and the orientation of the structures on a site. PRIMARY USE. An activity or combination of activities of chief importance on the site. One of the main purposes for which the land or structures are intended, designed, or ordinarily used. A site may have more than one primary use. PROJECT. An existing or proposed development. RAIL RIGHT-OF-WAY. See Transportation-Related Definitions. RECREATIONAL VEHICLE. See Vehicle Types. RECREATIONAL VEHICLE PARK. A commercial use providing space and facilities for motor homes or other recreational vehicles for recreational use or transient lodging. There is no minimum required stay in a recreational vehicle park. Uses where unoccupied recreational vehicles are offered for sale or lease, or are stored, are not included as Recreational Vehicle Parks. See also Mobile Home Park. RESIDENTIAL FACILITY. A residence for 6 to 15 physically or mentally disabled persons, and for staff persons. The facility may provide residential care alone, or in conjunction with training or treatment. This definition includes the State definition for Residential Facility. RESIDENTIAL HOME. A residence for five or fewer physically or mentally disabled persons, and for staff persons. The residence may provide residential care alone, or in conjunction with training or treatment. This definition includes the State definition of Residential Home. ATTACHED HOUSE. A dwelling unit, located on its own lot that shares one ore more common or abutting walls with one ore more dwelling units. The common or abutting wall must be shared for at least 50 percent of the length of the side of the dwelling. An attached house does not share common floor/ceiling with other dwelling units. An attached house is also called a rowhouse or a common-wall house. DUPLEX. A structure that contains two primary dwelling units on one lot. This units may share common walls or common floor/ceilings. DWELLING UNIT. A building, or a portion of a building, that has independent living facilities including provisions for sleeping, cooking, and sanitation, and that is designed for residential occupancy by a group of people. Buildings with more than one set of cooking facilities are considered to contain multiple dwelling units unless the additional cooking facilities are clearly accessory, such as an outdoor grill. GROUP LIVING STRUCTURE. A structure than contains sleeping areas and at least one set of cooking and sanitary facilities that is used as a residence for Group Living uses. HOUSE. A detached dwelling unit located on its own lot. MANUFACTURED HOME. A structure transportable in one or more sections, intended for permanent occupancy as a dwelling. All manufactured homes located in the City after the effective date of this Code shall meet or exceed the standards of the US Department of Housing and Urban Development, and shall have been constructed after June 15, 1976. MULTI-DWELLING STRUCTURE. A structure that contains three or more dwelling units that share common walls or floor/ceiling with one or more units. The land underneath the structure is not divided into separate lots. Multi-dwelling includes structures commonly called garden apartments, apartments, and condominiums. REVIEW BODY. The person or group who is assigned to make decisions on land use reviews, whether initially or on appeal. Review body includes the Planning Commission and the City Council. SETBACK. The minimum distance required between a specified object such as a building and another point. Setbacks are usually measured from lot lines to a specified object. Unless otherwise indicated, an unspecified setback refers to a building setback. 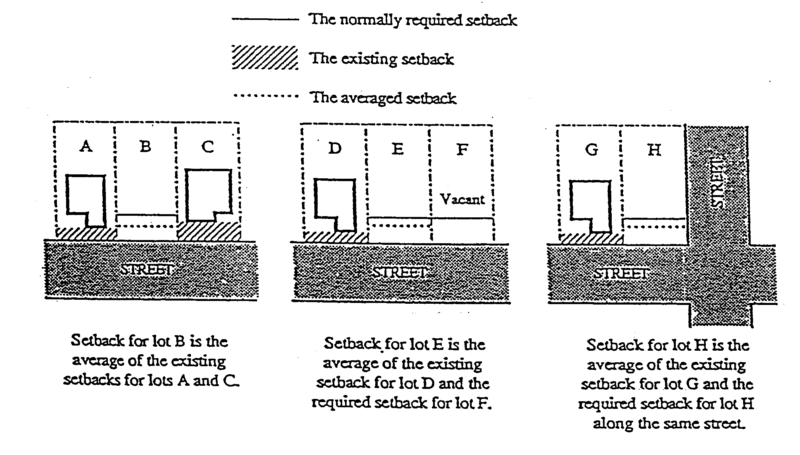 In addition, the following setbacks indicate where each setback is measured from. See Section 730 Measurements, for measurement information. Front Setback. A setback that is measured from a front lot line. Rear Setback. A setback that is measured from a rear lot line. Side Setback. A setback that is measured from a side lot line. BILLBOARDS. Signs advertising merchandise or services other than those available for sale on the premises. BUSINESS SIGNS. Sign which directs attention to a business, commodity, industry or service or other activity which is sold, offered or conducted on the premises upon which such sign is located, or to which it is affixed. DISPLAY. The surface made available by the sign structure for the mounting of material to carry the advertising or other message, trademark or emblem. DOUBLE-FACED SIGN. Sign with advertising on two (2) surfaces or plain back-to-back. ELECTRONIC DISPLAY SYSTEM: A video display board of varying display quality up to television quality in which the rate of change is electronically programmed and capable of providing animated messaging, video clips, rapidly alternating messages, images or methods which achieve apparent movement through electrical pulsations, including strobe lights and bead lighting, or any other presentation that could distract drivers. ELECTRONIC MESSAGE SIGN OR CENTER. A permanent sign that uses changing lights to form a written vertical or horizontal message, or messages, in which the sequence of messages and rate of change is electronically programmed in a dot matrix configuration which may be changed intermittently. Video signs are not included in this definition. FACE OF BUILDING. The wall of the building fronting on the street, excluding any appurtenances such as projecting columns, fins, pilasters, canopies, marquees, showcases or decorations, but including the parapet wall. FINISH GROUND LEVEL (GRADE). The average elevation of the ground adjoining the structure or building upon which the sign is erected. FREE-STANDING SIGN. Sign which is supported by one or more uprights or braces which are fastened to or embedded in the ground or a foundation in the ground; fence signs are considered in this category. Recreational and entertainment centers of recognized regional significance. Regional shopping centers maintaining a minimum of 100 parking spaces in the immediate vicinity. Major sports stadium, entertainment centers or convention centers having a seating capacity in excess of 1,000 persons. HEIGHT OF SIGN. The height of a sign shall be measured from the finished ground level, excluding mounds, berms and the like to the top of the sign or the highest portion of the sign structure or frame, whichever is greater. LOCATION. A lot or premise or building wall or any place whatsoever upon which a sign is erected, constructed and/or maintained. See also City Zoning Ordinance. MARQUEE OR READER BOARD (CHANGEABLE COPY) SIGN. A sign which is characterized by changeable copy, whether free-standing or wall sign or whether the sign projects from and/or is supported by a building. MULTI-FACE SIGN. A multi-face sign is one with more than one (1) section or module. NAMEPLATES. Signs identifying the name, occupation and/or profession of the occupant of the premises. PARCEL, TRACT OR LOT. For the purpose of determining sign requirements shall mean any parcel, tract or lot of real property under separate ownership or lease of at least fifteen (15) years duration from any other parcel, tract or lot having street or highway frontage or in the event of an arterial street or freeway within two hundred (200) feet thereof. PROJECTING SIGN. A sign which projects to within any public right-of-way except a wall sign as herein defined. REAL ESTATE SIGN. Any sign or sign structure relating to the sale, lease or other disposition of real property. ROOF LINE. The edge of the roof or the top of the parapet whichever forms the top line of a building silhouette; where a building has several roof levels, the roof line shall be the one belonging to that portion of the wall on which the sign is located. ROOF SIGN. A sign located and/or maintained upon the roof of any building. ROTATING OR REVOLVING SIGNS. A sign, all or a portion of which moves in some manner. SIZE (SIGN). The size of a sign shall be the entire area within any type of perimeter or border which encloses the outer limits of any writing, representation, emblem, figure or character. The area of a sign having no such perimeter or border shall be computed by enclosing the entire area within a parallelogram or a triangle of the smallest size sufficient to cover the entire area of the sign computing the area of the parallelogram or a triangle. Where a sign has two or more faces, the area of all faces shall be included in determining the area of the sign. STRUCTURE. The supports, uprights, bracing, guy rods or lines, cables or framework of a sign or outdoor display. TEMPORARY SIGN. Any advertising display or sign which shall appear or be located upon a particular parcel, tract or lot of real property for no more than sixty (60) days. If a proposed development includes more than one ownership, then all the ownerships are included as the site. If a proposed development includes only a portion of an ownership, and if the proposal is for new development, then the site is the portion of the ownership that is proposed for development. If there is existing development on an ownership, then the entire ownership in included as the site. An exception is when the proposed development is separated from the existing development by landscaping, screening, setback, or buffering measures, as would be required if the proposed development was on a separate ownership. In this case, the site is the portion of the ownership that is proposed for development. See also, Lot and Ownership. BUILDING LINE: A line on a plat or map indicating the limit beyond which buildings or structures may not be erected. CROSSWALK: A right-of-way across a block to facilitate pedestrian access to adjacent streets and properties. DEED RESTRICTIONS: A covenant or contract constituting a burden in the use of private property for the benefit of property owners in the same subdivision, adjacent property owners, the public or the City of Wood Village, and designed to mitigate or protect against adverse impacts of a development or use to ensure compliance with the Comprehensive Plan. EASEMENT: The grant of the legal right to use a strip of land for specific purposes. PARCEL: A unit of land that is created by a partitioning of land. PARTITION LAND: To divide an area or tract of land into two or three parcels within a calendar year when such area or tract of land exists as a unit or contiguous units of land under single ownership at the beginning of such year. “Partition land” does not include divisions of land resulting from lien foreclosures; divisions of land resulting from the creation of cemetery lots; and divisions of land made pursuant to a court order, including but not limited to court orders in proceedings involving intrastate or interstate succession; and “partition land” does not include any adjustment of a lot line by the relocation of a common boundary where and additional parcel is not created and where the existing parcel reduced in size by the adjustment is not reduced below the minimum lot standards of this Code. Partitioned land does not include a sale or grant by a person to a public agency or public body for state highway, county road, city street or other right-of-way purposes provided that such road or right-of-way complies with the applicable comprehensive plan or ORS 215.213 (2) (q) to (s) and 215.283 (2) (p) to (r). PARTITION PLAT: Partition plat includes a final map and other writing containing all the description, locations, specifications, provisions and information concerning a major or minor partition. PEDESTRIAN WAY: A right-of-way for pedestrian traffic. PLANNING COMMISSION: The Planning Commission of the City of Wood Village. PLAT: The final map, diagram, drawing, replat or other writing containing all the descriptions, locations, specifications, dedications, provisions, and information concerning a subdivision. SIDEWALK: A pedestrian walkway with permanent surfacing. STREET: A public or private way that is created to provide ingress or egress for persons on foot, in vehicles, or otherwise, to one or more lots, parcels, areas or tracts of land and including the term “road”, “highway”, “lane”, “avenue”, “alley”, “boulevard”, “parkway”, or similar designations. (a) Alley: A narrow street generally through a block used primarily for vehicular service access to the back or side of properties otherwise abutting another street. (b) Arterial: A street used primarily for through traffic. (c) Collector: A street used to some extent for through traffic but primarily for access to abutting properties. (d) Cul-de-sac (dead-end street): A short street having one end open to traffic and being terminated by a vehicle turn-around. (e) Half Street: A portion of the width of a street, usually along the edge of a subdivision, where the remaining portion of the street could be provided in another subdivision. (f) Marginal Access Street: A minor street parallel and adjacent to a major arterial street providing access to abutting properties, but protected from through traffic. (g) Minor Street: A street intended primarily for access to abutting properties. SUBDIVIDER: An individual firm or group who undertakes the subdivision of a lot, tract or parcel of land for the purpose of transfer of ownership or development, and including changes in street or lot lines. SUBDIVIDE LAND: To divide an area or tract of land into four or more lots within a calendar year when such area or tract of land exists as a unit or contiguous units of land under a single ownership at the beginning of such year. SUBDIVISION: Either an act of subdividing land or an area or tract of land subdivided as defined in this Code. THROUGH LOT. See Lot, under Parcel Types. THROUGH CONNECTION. A grade level pedestrian, cycling, or vehicle access route that is accessible to the public and extends through a city block, and includes but is not limited to a pedestrian walkway, a Street, or an access route through public or private land. TOWN CENTER DEVELOPMENT PLAN. A Town Center Development Plan refers to information submitted by an applicant seeking approval for development within the Town Center Zone area. It includes, at a minimum, diagrams, narrative and other information as required by Section 235.400. The Town Center Development Plan explains how the applicant intends to meet the requirements of Chapter 235, including the requirements of Figure 235 – 1 (Concept Plan Regulating Diagram), and other applicable chapters and sections of the Wood Village Zoning and Development Code. FREEWAY (EXPRESSWAY) (THRU-WAY): Such streets, highways or roads of the City of Wood Village as approved by appropriate State Agency. RAIL RIGHT-OF-WAY. A public or private right-of-way, for the purpose of allowing rail travel. RIGHT-OF-WAY. A public or private area that allows for the passage of people or goods. Right-of-way includes passageways such as freeways, streets, bike paths, alleys, and walkways. A public right-of-way is a right-of-way that is dedicated or deeded to the public for public use and under the control of a public agency. ROADWAY. The portion of a street that is improved for motor vehicular travel. Roadway includes vehicle travel lanes and on-street parking areas. Roadway does not include area devoted to curbs, parking strips, or sidewalks. STREET. A public or private right-of-way that is intended for motor vehicle travel or for motor vehicle access to abutting property. Street includes all the area within the right-of-way, such as roadways, parking strips, and sidewalks. For the purposes of this Title, street does not include alleys, rail rights-of-way that do not also allow for motor vehicle access, or the interstate freeways and the Sunset highway including their ramps. VEHICLE AREAS. All the area on a site where vehicles may circulate or park including parking areas, driveways, drive-through lanes, and loading areas. See also, Driveway and Parking Area. MOTOR VEHICLE. Vehicles that have their own motive power and that are used for the transportation of people or goods on streets. Motor vehicle includes motorcycles, passenger vehicles, trucks, and recreational vehicles with motive power. See also Passenger Vehicle, Recreational Vehicle and Truck. PASSENGER VEHICLE. A motor vehicle designed to carry ten persons or less including the driver. Passenger vehicle also includes motor vehicles designed to carry ten persons or less that are constructed with on a truck chassis or with special features for occasional off-road use. Passenger vehicle includes vehicles commonly called cars, minivans, passenger vans, and jeeps. Passenger vehicle is intended to cover the vehicles defined as passenger cars and multipurpose passenger vehicles by the National Highway Traffic Safety Administration, in Title 49 of the Code of Federal Regulations, Chapter V, Section 571.3. See also Recreational Vehicle and Truck. MOTOR HOME. Motor home includes motorized vehicles designed for human occupancy on a intermittent basis. A camper is considered a motor home when it is on the back of a pick-up or truck. Motor homes are regulated as trucks unless the regulations specifically indicate otherwise. See also Truck. ACCESSORY RECREATIONAL VEHICLE. Accessory recreational vehicle includes non-motorized vehicles designed for human occupancy on an intermittent basis such as vacation trailers and fifth-wheel trailers. A camper is considered an accessory recreational vehicle when it is standing alone. Accessory recreational vehicle also includes vehicles designed for off-road use such as off-road vehicles, dune buggies, and recreational boats. TRUCK. A motor vehicle which is designed primarily for the movement of property or special purpose equipment, or a motor vehicle that is designed to carry more than ten persons. Truck includes vehicles commonly called trucks, pick-ups, delivery vans, buses, motor homes and other similar vehicles. Truck is intended to cover the vehicles defined as trucks and buses by the National Highway Traffic Safety Administration, in Title 49 of the Code of Federal Regulations, Chapter V, Section 571.3. Trucks are divided into three categories by size as stated below. See also Passenger Vehicle, and Recreational Vehicle. LIGHT TRUCK. Light trucks are trucks and similar vehicles with single rear axles and single rear wheels. MEDIUM TRUCK. Medium trucks are trucks and similar vehicles, other than truck tractors, with single rear axles and dual rear wheels. Truck tractors are in the Heavy Truck category. HEAVY TRUCK. Heavy trucks are trucks, including truck tractors, and similar vehicles with two or more rear axles. UTILITY TRAILER. A vehicle designed to be pulled by a motor vehicle which is used to carry property, trash, or special equipment and that is 16 feet or less in length. Boat trailers are included as utility trailers. Utility trailers that are longer than 16 feet in length are considered industrial vehicles and are regulated as heavy trucks. DEMOLITION LANDFILL. A land disposal site for receiving, sorting and disposing only land clearing debris, including vegetation and dirt, building construction and demolition debris and inert materials, and similar substances. HOUSEHOLD HAZARDOUS WASTE DEPOT. A facility for receiving, sorting, processing and temporarily storing household hazardous waste and for preparing that waste for safe transport to facilities authorized to receive, process, or dispose of such materials pursuant to federal or state law. LIMITED PURPOSE LANDFILL. A land disposal site for the receiving, sorting and disposing of solid waste material, including but not limited to asbestos, treated petroleum contaminated soil, construction, land clearing and demolition debris, wood, treated sludge from industrial processes, or other special waste material other than unseparated municipal solid waste. RESOURCE RECOVERY FACILITY. A facility for receiving, temporarily storing and processing solid waste to obtain useful material or energy. MIXED CONSTRUCTION AND DEMOLITION DEBRIS RECYCLING FACILITY. A facility that receives, temporarily stores, processes, and recovers recyclable material from mixed construction and demolition debris for reuse, sale, or further processing. SOLID WASTE COMPOSTING FACILITY. A facility that receives, temporarily stores and processes solid waste by decomposing the organic portions of the waste by biological means to produce useful products including, but not limited to, compost, mulch and soil amendments. MONOFILL. A land disposal site for receiving, sorting and disposing only one type of solid waste material or class of solid waste materials for burial, such as a facility that accepts only asbestos. MUNICIPAL SOLID WASTE DEPOT. A facility where sealed containers are received, stored up to 72 hours, staged, and/or transferred from one mode of transportation to another. SMALL SCALE SPECIALIZED INCINERATOR. A facility that receives, processes, temporarily stores, and burns a solid waste product as an accessory use to a permitted use, including incinerators for disposal of infectious wastes as part of a medical facility, but not including mass burn solid waste incinerators, refuse-derived fuel technologies, human or animal remains crematorium, or any energy recovery process that burns unseparated municipal solid waste. SOLID WASTE FACILITY. Any facility or use defined in Section 1 of this attachment. SOLID WASTE TRANSFER STATION. A facility that receives, processes, temporarily stores and prepares solid waste for transport to a final disposal site, with or without material recovery prior to transfer. TREATMENT AND STORAGE FACILITY. A facility subject to regulation under the Resource Conservation and Recovery Act, 42 USC §§ 6901-6987, for receiving, sorting, treating, and/or temporarily storing hazardous waste, and for processing such waste for safe transport to facilities authorized to receive, treat, dispose of such materials pursuant to federal or state law. Treatment and storage facilities do not include facilities for on-site disposal of hazardous waste. WOOD WASTE RECYCLING FACILITY. A facility that receives, temporarily stores and processes untreated wood, which does not contain pressure treated or preservative treated wood, in the form of scrap lumber, timbers, or natural wood debris, including logs, limbs, and tree trunks, for reuse, recycling or energy recovery into products such as hogged fuel, fuel pellets, or fireplace logs. YARD DEBRIS DEPOT. A facility that receives yard debris for temporary storage, awaiting transport to a processing facility. YARDS. A required open space, on a lot, such space being unoccupied and unobstructed by any structure or portion of a structure, from the ground to the sky, except for permitted projecting building features and accessory structures when in conformance with this Code. Each yard shall be measured by striking a line parallel to the corresponding lot line the distance required by the setback standard of the base zone. ZONE. Refers to land use regulatory zones (Districts) under the Zoning Ordinance of the City of Wood Village. This Section explains how measurements are made in the zoning code. A. Minimum Requirements. When a regulation is expressed in terms of a minimum requirement, any fractional result will be rounded up to the next consecutive whole number. For example, if a minimum requirement of one tree for every 30 feet is applied to a 50 foot strip, the result of 1.67 is rounded up to 2 required trees. B. Maximum Limits. When a regulation is expressed in terms of maximum limits, any fractional result will be rounded down to the next lower number. For example, if a maximum limit of one dwelling unit for every 8,000 square feet is applied to an 18,000 square foot site, the resulting fraction of 2.25 is rounded down to 2 allowed dwelling units. A. Distances are measured horizontally. When determining distances for setbacks and structure dimensions, all distances are measured along a horizontal plane from the appropriate property line, edge of building, structure, storage area, parking area, or other object. These distances are not measured by following the topography of the land. See Figure 730-1. B. Measurements are shortest distance. When measuring a required distance, such as the minimum distance between a structure and a lot line, the measurement is made at the shortest distance between the two objects. See figure 730-2. 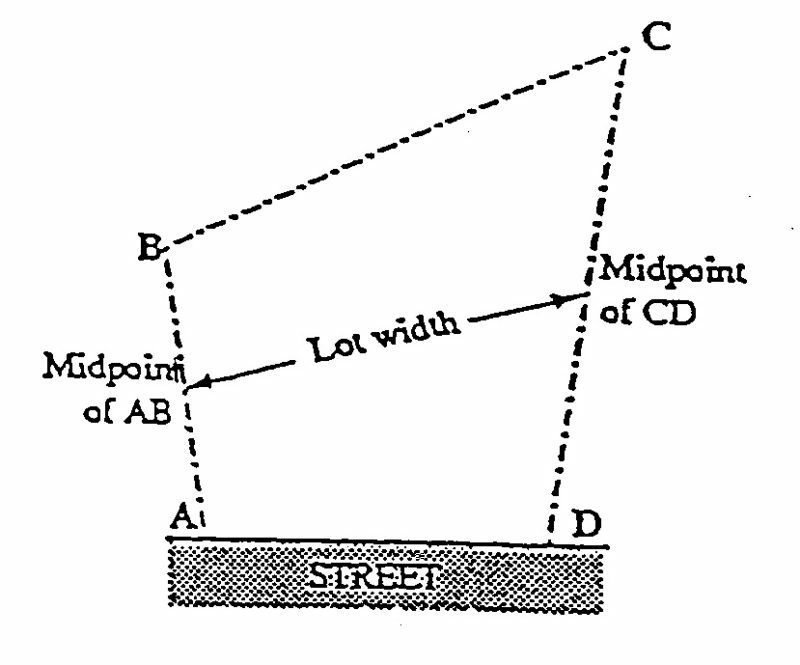 Exceptions are stated in Subsection C, D and E.
Figure 730-2 Closest Distance – Measurement is taken from the shortest Distance between the points. C. Measurements of vehicle travel areas. Measurements of a minimum travel distance for vehicles, are measured down the center of the vehicle travel area. 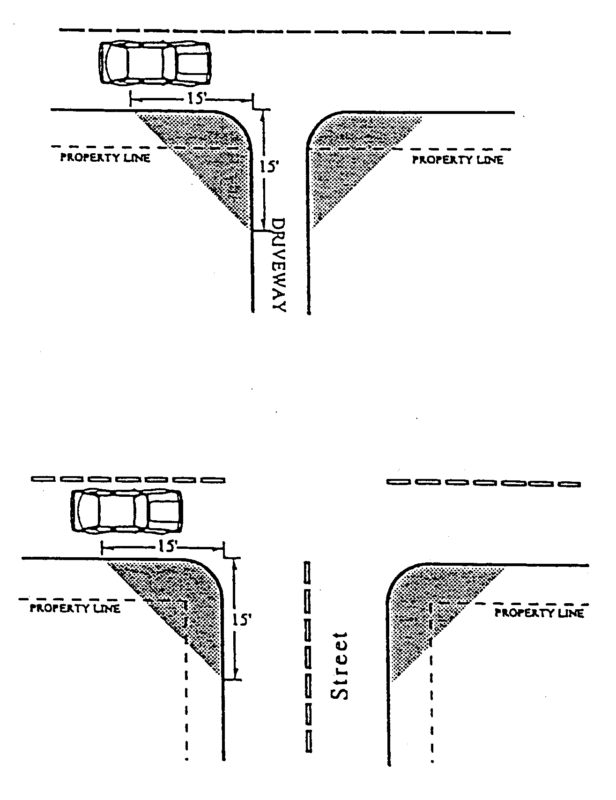 For example, curving driveways and travel lanes are measured along the arc of the driveway or traffic lane. See Figure 730-3. 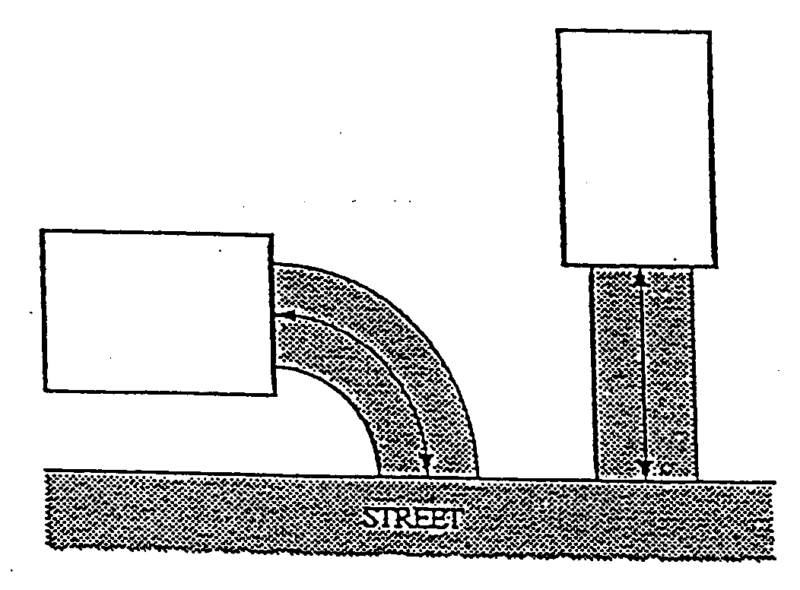 Figure 730-3 Measuring Vehicle Travel Areas – Measure down the middle of the travel area. D. Measurements involving a structure. 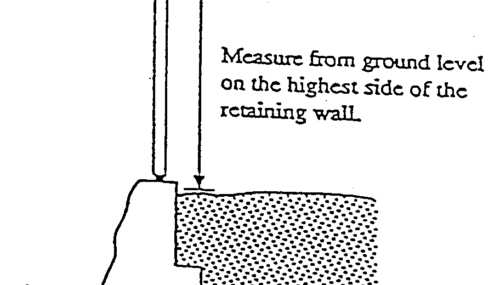 Measurements involving a structure are made to the closest wall of the structure. Chimneys, eaves, and bay windows up to 12 feet in length, are not included in the measurement. Other items, such as covered porches and entrances, are included in the measurement. See figure 730-2 above, and the base zone sections. E. Underground structures. Structures or portions of structures that are entirely underground are not included in measuring required distances. See Figure 730-4. Zone boundaries that are shown crossing lots are usually based on a topographic feature or a set measurement from a property line or topographic feature, such as the top of slope, middle of stream, 25 feet from top of bank, or 30 feet from the property line. When zone boundaries are shown crossing properties with no clear indication of the basis for the line, exact distances are to be determined by scaling the distances from the Official Zoning Maps, using the center of the zoning line. A. Measuring building height. Height of buildings is generally measured as provided in the Oregon Structural Specialty Code (the Uniform Building Code as amended by the State). The height of buildings is the vertical distance above the base point described in paragraphs 1 or 2 below. The base point used is the method that yields the greater height of the building. For a flat roof, the measurement is made to the top of the parapet, or if there is no parapet, to the highest point of the roof. The measurement is made to the deck line of the mansard roof, or to the average height of the highest gable of the pitched or hipped roof that has a roof pitch of 12 in 12 or less. For pitched or hipped roofs with a pitch steeper that 12 in 12, the measurement is to the highest point. For other roof shapes such as domed, vaulted, or pyramidal shapes, the measurement is to the highest point. See Figure 730-5. The height of a stepped or terraced building is the maximum height of any segment of the building. Base Point 1. 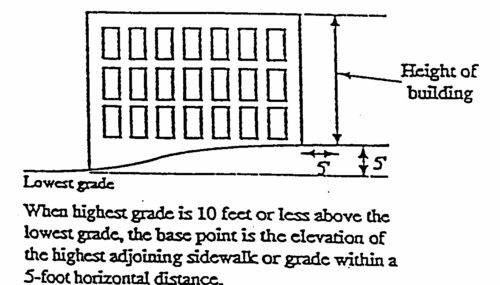 Base point 1 is the elevation of the highest adjoining sidewalk or ground surface within a 5 foot distance of the exterior wall of the building when such sidewalk or ground surface is not more than 10 feet above lowest grade. See Figure 730-6. Base Point 2. 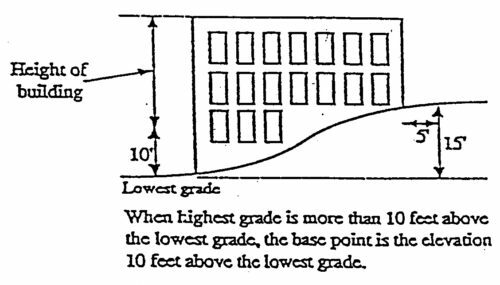 Base point 2 is the elevation that is 10 feet higher than the lowest grade when the sidewalk or ground surface described in paragraph 1. above, is more than 10 feet above the lowest grade. See Figure 730-7. B. Measuring height of other structures. The height of other structures such as flag poles and fences is the vertical distance from the ground level immediately under the structure to the top of a structure, excluding exempted portions. When chimneys and other objects are allowed to exceed the base height of the zone by a set amount, that set amount is measured to the top of these objects. Special measurement provisions are also provided below. Measuring height of retaining walls and fences. Retaining walls and fences on top of retaining walls are measured from the ground level on the higher side of the retaining wall. See Figure 730-8. Measuring height of decks. Deck height is determined by measuring from the ground to the top of the floor of the deck if there is no rail or if the rail walls are more than 50 percent open, and from the ground to the top of the rails for all other situations. A. Average slope used. 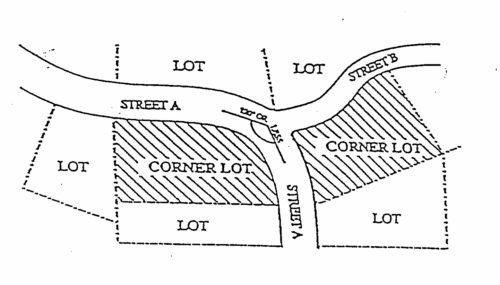 When calculating the slope of a lot, an average slope is used based on the elevations at the corners of the lot. The average slope of a lot is calculated by subtracting the average elevation of the uphill lot line and the average elevation of the downhill lot line and dividing the sum by the average distance between the two lot lines. The average elevation of the uphill and downhill lot line is calculated by adding the elevations at the ends of the lot line and dividing by two. See Figure 730-9. 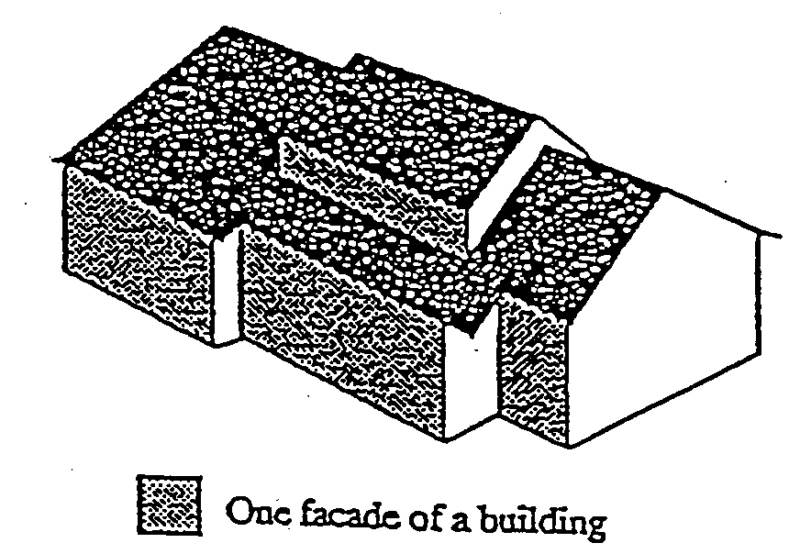 The area of a specific façade of a building is determined by adding the square footage of surface area of each section of wall visible from that perspective. For buildings with more than one wall along one facade (for example, rooms jutting out from the main building or a building where each floor is set back from the floor below), all of the walls are included in the total area. The total area does not include any roof area. See Figure 730-10. 730.080 Determining the Plane of a Building Wall. The purpose of this measurement system is to provide a way to calculate varying amounts of bulk on a particular side of a structure. The plane of a building wall is a plane that extends from the ground to the top of each wall of a structure. A structure with more than one wall along one façade (for example, room jutting out from the main structure or a structure where each floor is set back from the floor below) will have a different plane for each of the walls. The area of the plane is determined by calculating the area of the plane from the ground to the top of the wall. The plane does not include roof area. In situations where there is more than one wall along one façade, the bulk of the closer walls cover the bulk of walls that are further back. In these situations, the wall is measured by extending the plane of the wall to the area that is behind a closer wall. See Figure 730-11. [There are special measurement rules for situations where the plane of the building wall is wider than portions of the wall below]. See Figure 730-12 below. Where the plane of the building wall contains portions that are wider than areas of the wall that are below it, the calculation of area is made using the wider dimension and extending the plane to the open area below. See Figure 730-12. 730.090 Measuring Lot Width and Depths. Lot widths and depths are measured from the midpoints of opposite lot lines. See Figures 730-13 and 730-14. 730.100 Measuring Areas with Squares of Specified Dimensions. Required areas (for example, required outdoor areas in residential zones) must be of a sufficient size and configuration so that a square measuring x by x can be placed totally within the required area. The dimensions of the square are stated in the base zone and additional regulations sections. See Figure 730-15. A. The setbacks used for the calculations must be the same type of setback that is being averaged. For example, only front setbacks can be used to average a front setback. B. Only the setbacks on the lots that abut each side of the site and are on the same street may be used. Setbacks across the street or along a different street may not be used. C. When an abutting lot is vacant or if the lot is a corner lot, then the average is of the setback of the non-vacant lot and the required setback for the zone. No signs, structures or vegetation in excess of three (3) feet in height shall be placed in “vision clearance areas”, as shown below. The minimum vision clearance area may be increased by the Public Works Director upon finding that more sight distance is required (i.e., due to traffic speeds, roadway alignment, etc. ).